mad orange fools: Because this is one of things I do. I take pictures of us on our anniversary. 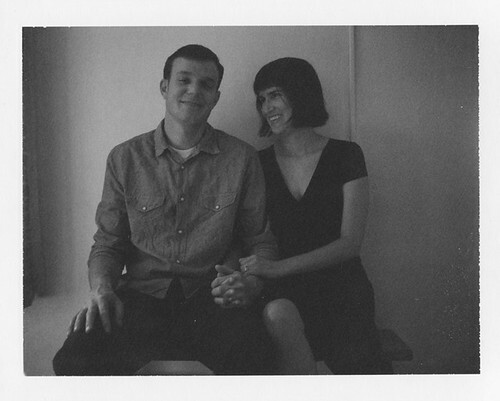 With instant film, natch. I didn't realize the flash was on when I took the first Spectra shot in the mirror. So we did it again. This is the one that came out cute except you can see how dirty the mirror is. Ooops. This is the one we took after we cleaned the mirror. This is the black and white one. And this is the one in which I have fish lips and Will is looking at the camera trying to figure out how to press the button and we didn't realize that we should move the lamp. It all makes me smile! the black and white one is precious. now we need pictures of the dinner! oh they are coming! only four, but i just wrote out the whole post about the food. i shall post it in the AM!